Each year in late May we suspend our timetable for pupils in S1, S2 and S3 in order to allow pupils and staff to participate in a wide range of activities both in and out of school. As our senior pupils are on study leave for their SQA Exams we are able to run activities for pupils in the lower school while ensuring that staff supervision ratios are met for outdoor and more adventurous activities. The range of activities on offer for all pupils are very costly to the school. Our annual Sponsored Walk allows us to raise a significant sum of money for our School Fund. This Fund supports extra-curricular activities and our Activities Days. 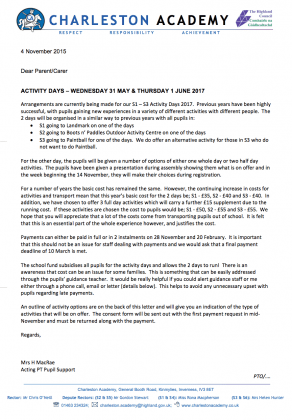 However, due to transport costs associated with Activities out with school it is necessary to charge a little extra to ensure the range of activities on offer is broad and interesting. This year we have some very exciting new opportunities including Go Karting and Snowboarding. We are also very pleased to introduce residential trips, venturing to Alton Towers, His Majesty’s Theatre in Aberdeen, and a canoeing and camping trip with Boots ‘n’ Paddles Outdoor Adventure Centre. Participation in Activities Days gives pupils a fabulous opportunity to try out and participate in an activity they may have had little or no prior experience of. On the other hand, some activities require that pupils meet a minimum level of skill in order to participate. However, of more importance to the general ethos of our Activities Days is the opportunity pupils have to work with their peers across different year groups and our teachers in an environment that is very different from the classroom. The value of the school community getting to know one another in this way cannot be under-estimated and is one of the main reasons why we consider Activities Days to be a valuable and worthwhile addition to the curriculum. Mrs Heather MacRae co-ordinates all of our Activities but she is assisted by an experienced and committed team of other staff who help with the planning and booking of the activities, carrying out risk assessments, and leading the various activities that we have on offer.